For a while now I have been working on building my own shock dyno so that I can take a more technical approach to the adjuster knob(s) on my shocks, rather than just guessing . I finally finished it a few days ago and have been playing with one of the Koni 8611's that will (eventually) be going on my car. The "Optimal" curves are for the front of an MR2 (roughly 500lb per corner) with 400lb springs, and were generated using the equations found here:http://www.optimumg.com/docs/Springs...Tech_Tip_4.pdf, with a damping ratio of .65 and a high/low split point of 3in/s. Based on this, I would say that 400lb is about the minimum front spring rate that would be appropriate with these shocks, although one could argue that the sway bar should be at least partially factored into the shock valving calculation. Each curve is shown in the key twice since I have to plot compression and rebound separately. The baseline curve is with both compression and rebound set to full soft. 1 and 2 turns rebound are, as you would guess, that many turns stiffer. Notice that the compression damping curves are barely visible, they overlay on the baseline curve so well. VERY little cross talk on the adjusters! 1 turn rebound #2 was when I went backwards from 2 turns down to 1 turn. As you can see, it overlays very closely on the original 1 turn graph. 2 and 4 clicks bump are, again as you would guess, that many clicks increased. There are 11 clicks (12 steps) total in bump, although I cannot imagine using more than 2 or three of them. 2 clicks would be about optimal for an 800lb front spring! Again notice that the rebound graphs for these two overlay almost perfectly with the original baseline rebound graph. 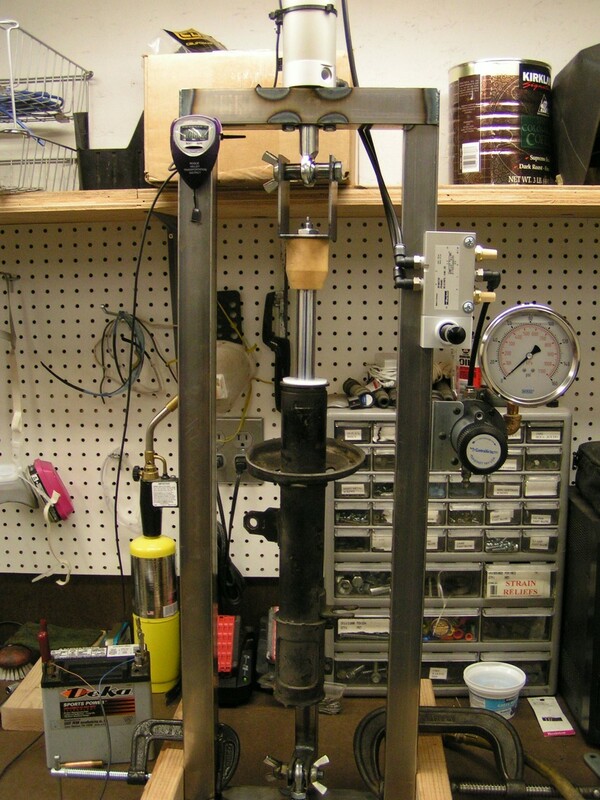 The dyno I built is nothing particularly innovative, just your basic pneumatic shock dyno. Apply a known force to the shock and time how long it takes to travel a known distance and you can easily compute force vs velocity. Varying the pressure changes the force, and the resultant velocity. I did however take some steps to make it as accurate and repeatable as possible by using a high quality regulator and gauge. I typically run two cycles up/down at each pressure, and it is not uncommon to get two back to back times that are the same to within 1/100th of a second. Last edited by Alex W; October 31st, 2018 at 10:11. You are my hero. I hope you continue to do MR2 related things for a long while. The Miata guys have a bunch of aftermarket support including a suspension specialist in Shaikh at FCM and now for the last few years, you've been supplying us with badass suspension gear. Thank you! Looks great Alex, I can't wait for your testing on the rear. Isn't the max spring rate for the 8611 something like 500 or 550? Great work Alex! Any more info on the dyno? You have this a lot more sophisticated than I would imagine. I have seen a DIY dyno made with a manual lever before. Yours is that much better. Thanks guys. The next project is to test the other -1257 as well as the two -1259's that I have to see how they match up shock to shock, and to see if there is any obvious difference between the -1257 and the -1259 (I wouldn't expect there to be, but we will see). Regarding max spring rate, based on what I am seeing here the upper limit would be far outside the realm of reasonable for an MR2. 1000+lb should be easy to match. Granted there are a lot of theories on shock valving and this is the softer, more compliant theory. Most of the parts are from McMaster. Pneumatic cylinder, two way valve, and the as mentioned high quality regulator and gauge. The cylinder is "switch ready", meaning it has a magnet in the piston, which triggers a pair of proximity switches, which are wired into an old stop watch that my wife had laying around. It is very similar in design to this: http://www.shockdyno.com/howitworks.html, but obviously much less expensive to make yourself than to buy. 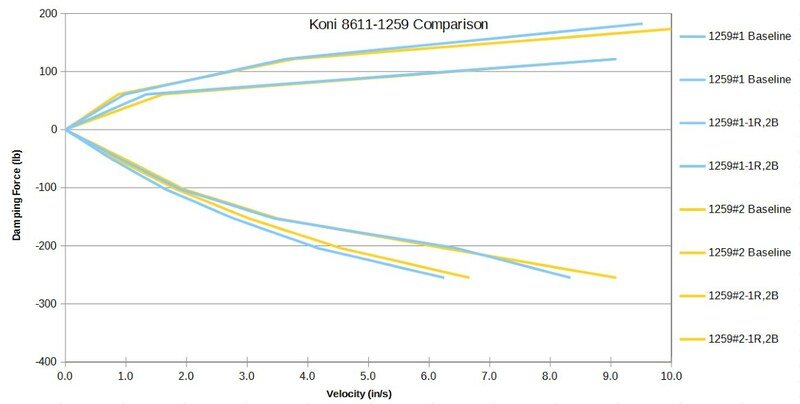 Any plans to dyno the regular Konis for comparison or just for info purposes? I have the regular koni inserts but i've found them to be downright inadequate when it comes to small bump compliance. I can't figure out if the high-speed compression and damping is either too stiff or not stiff enough from the get go. The shock seems to handle the low speed compression/rebound stuff ok but i'm constantly struggling for good traction on washboard type stuff or roads made with that chunky gravel. Last edited by matadorCE; January 29th, 2015 at 12:14. Yeah, that's in the plans for this spring as well. I have a set of regular Koni Yellows for the MKII that I am using in a set of coilovers on my MKI that I plan to pull off and dyno. Both for informational purposes, and to get a better starting point for that setup. Awesome, thanks for doing all this. 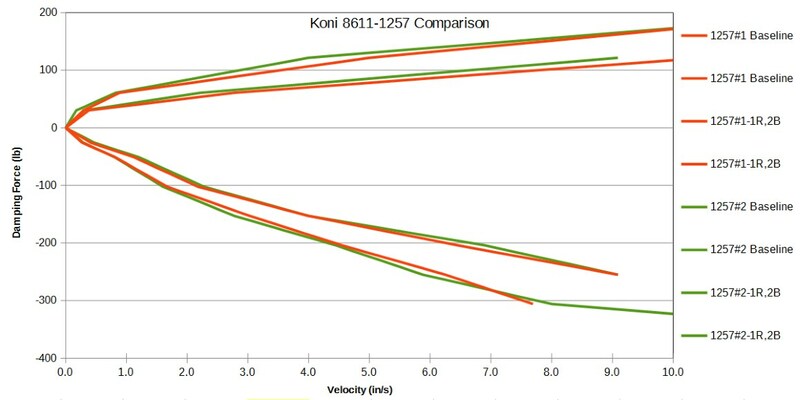 I'd definitely like to find out what the correct spring rate range is for the regular Konis. Man, I want to send my white TRD coilovers to you to be dynoed. You should offer this as a service! This afternoon I dynod the rest of my set of 8611's (the other -1257 that will go on the front, and the two -1259s for the rear). Having established to my satisfaction that the adjusters work as advertised, and with pretty good consistency / repeatability, I only did two tests on these. One at full soft, one at 1 turn rebound / 2 clicks bump. I didn't intend to, but by pairing the "#1" shock of each pair together on the 1257 vs 1259 graph I accidentally plotted the softest -1257 vs the stiffest -1259. So for this particular set of four shocks, that is a worst case scenario in terms of match. I also noticed that the first of the -1259's that I tested seemed to have a little more friction than the others. Typically I have been starting my tests at 10psi (about 30lb force), and this particular shock would move a little and then stall at that force. At 20psi and higher it worked just fine, and in terms of the dyno plots it doesn't seem to have affected it, but I didn't get a 10psi data point for either of the 1259's as a result. Last edited by Alex W; October 31st, 2018 at 09:15.
with the car not being a 50/50 on weight its not a cut and dry suspension. i would assume this would only grow a further problem with running autox or road course. i am aware the inside and far out seems very wrong but its really not lol.. i can explane it but i think alex will figure it out. my second hurdle in the puzzle is obvious sping.. its not only weight to think about but if its a progressive or static spring. different coils will do different things. Also, looks like the struts match pretty well so you most likely won't have to adjust each strut differently (unlike say, Koni Yellows which can be relatively far off from each other) between left and right sides. Yeah, they are close enough that I wouldn't bother trying to "match" them. I am planning on dynoing my set of Koni Yellows this weekend, really curious to see how well they match up. Also really curious to get a better idea on ideal spring rates for them. Wow, that is really cool Alex. I am always reading up on your suspension threads. Can't wait to see how the Koni yellows stand up since that is what I have. There is lots of info out there on the yellows so can't wait to see how your dyno stacks up. Last edited by Alex W; February 11th, 2015 at 08:18.